Ryanair, Malta’s No.1 airline, today (11 Sep) launched its biggest ever Summer 2019 schedule for Malta where it will base a new aircraft, and add 10 new routes, with 61 routes in total, which will deliver 3.1m customers p.a. through Malta airport next year, as Ryanair grows it’s Malta traffic by 15%. – 2,325* “on-site” jobs p.a. In addition to these 61 Summer 2019 routes, Ryanair recently launched a new flight partnership with Air Malta, which will allow Ryanair.com’s 600 million annual visitors to book Air Malta flights on the Ryanair.com website. Customers can browse and book Air Malta flights on 21 new winter routes from Malta to 8 different countries across Africa, Asia and Europe, including Russia and Tunisia. 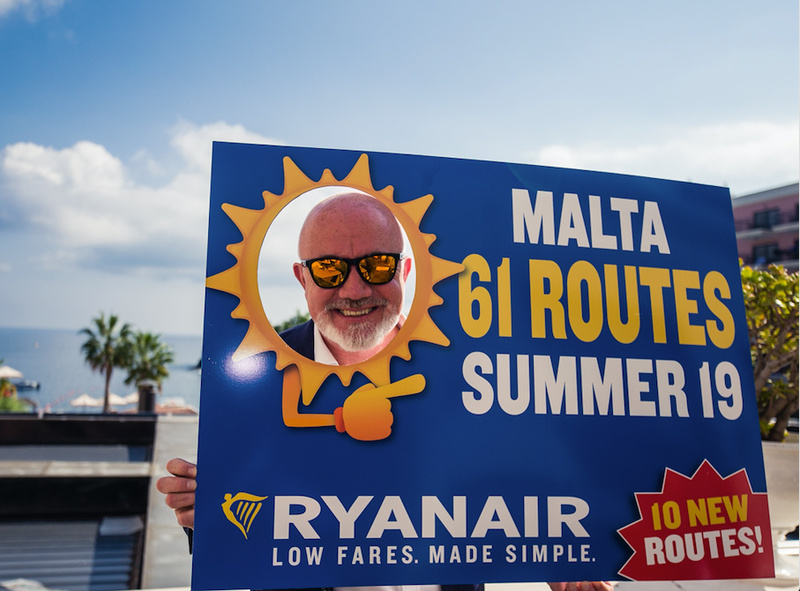 “Ryanair is pleased to launch our biggest ever Malta Summer 2019 schedule with 61 routes, including 10 new routes to/from exciting cities such as Luxembourg, Perugia and Thessaloniki. Our Summer 2019 schedule will deliver 3.1m customers p.a. to/from Malta airport, all at the lowest fares, as we continue to grow Maltese routes, traffic, tourism and jobs. Dr Gavin Gulia, Executive Chairman of the Malta Tourism Authority (MTA) held that these ten new routes compliment the Authority’s strategy of connecting Malta to as many destinations as possible. He observed that most of these routes take visitors to cities that are currently not directly connected to Malta, and this will open up new opportunities towards spreading Malta’s connectivity. Most of the new routes are from destinations which fit the target profile of tourists to Malta, namely urban residents seeking Mediterranean coastal destinations with a rich cultural offer.Dr Gulia concluded by saying that this announcement is a strong signal of Malta’s continued popularity as a destination possessing further growth prospects. Minister for Tourism Hon. Konrad Mizzi mentioned that the new routes are expected to attract around 120,000 additional passengers between April and December next year going up to 150,000 tourists per annum between January and December 2020. The additional routes include a mix of cities from catchment areas which are not adequately served by existing connections. “It is very positive to note that Ryanair will be investing a further €100M to base another aircraft in Malta, its 6th aircraft to date. This announcement demonstrates Ryanair’s continued commitment to Malta” the Minister added.